2. 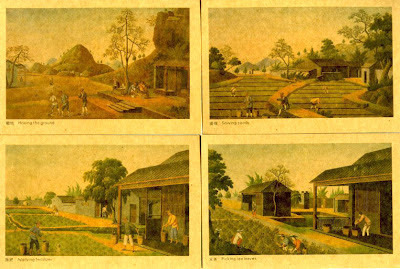 A set of postcard with historical paintings of tea cultivation, processing and trade. 3. 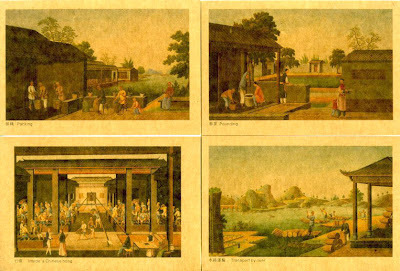 A set of postcard with historical paintings of porcelain making and trade. Enlarged pictures can also be found here. The best yixing art book ever! A book dominated by pictures and doesn't require any language proficiency! It's probably the best Yixing book ever, and the Yixing art works showed in this book are probably the best you would find in a book. It's a book in Chinese. But I would like to introduce this book to Yixing fans in any country because this book has very little text and primarily composed of pictures. Basically you don't have to "read" to "watch" this book. Typical pages of the book are as showed by the second, third and fourth pictures of this webpage. They are dominated by photographs of yixing art works, with little to none text. The pages such as the one showed in the fifth picture are about the most text-dense pages in the book. Out of the 400 pages, there are about 26 pages with a mix of text and pictures. All the rest are primarily composed of pictures as showed in other photos of this listing. This is why we are confident that this book could be the best reference book of yixing for any yixing lover who speaks any language. First of all, this book is edited by Gu Jingzhou (顾景舟), the most recent "Godfather" of Yixing. Secondly, this book has more than 500 nice photos of yixing ware (mostly teapots but also including vases, plant pots, and yixing sculptures). Each of them was hand picked and carefully inspected by Gu Jingzhou himself. Many of them are from collection of top-notch museums or the best yixing collectors. I can't imagine there could be another book with this number and this level of yixing image collection. Thirdly, this book was made in planned-economy era. The efforts made to gather the image materials and write the book can't be evaluated by money, and the book wasn't made with a budget or profit in plan. That's also why a second book of this level of image collection is not likely to be seen in the current commercialized society. This book was published in 1992. There is a Hong Kong version and a Taiwan version (same contents, different covers). This one is the Taiwan version by Taiwan Far East Publishing House. The retail price in 1992 is NT2800 (about US$70-80). The price of Hong Kong version was a little more expensive. It's a book that is not rare, but is no longer printed. It's not wanted by everybody, but those who want it can't always easily find it. Therefore, we are able to, and would love to, provide it to yixing lovers worldwide, at the best price that we can offer. The page size is about the size of A4 office supply printing paper. The book is big, 400 pages, 5 lb. Due to the years of warehousing and international transportation, we can't guarantee each copy of the book is spotless new. There might be some small dents at the corners or on the cover. But over all the book looks new, as seen on the pictures of this page. The hard cover of the book also protects it quite well through storage and transportation. When shipping to an address in the US, media mail will be used and it will take about 1-2 weeks. Please contact us if you would like to upgrade to a faster mailing service. When shipping to other countries, a copy will be shipped from Asia and it will take 2-3 weeks. The postcards are made with retro style dark paper, and the original paintings seem to be between water color and gouache, so the colors are not very bright. The scanned image looks like those under strong light. The real color of the cards are darker. They are all of the regular postcard size. There is English caption on each card, but I think I've spotted a few typos on one of the cards that has a longer paragraph. But generally the English caption conveys the meaning all right. The first four shows the cultivation. But I have doubts about the sowing, plowing and fertilizing pictures as the fields don't really look like tea fields, and most new tea bushes are not planted by sowing the seeds. Those pictures could be interpreted as cultivation of other things too. On the back of the first card (sowing), there is also a note that these pictures were painted for foreign merchants to take home as souvenirs. 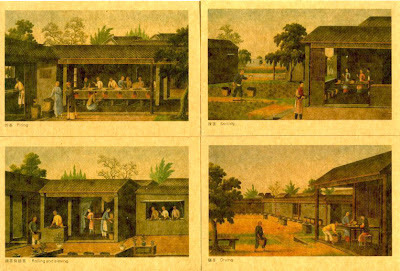 So probably the main purpose of these pictures was to illustrate scenes of Chinese agricultural society, and the accuracy of cultivation probably wasn't important. In the next 4 pictures, the "pounding tea" puzzles me. Where and when does this happen? Although Hakka people have "pounded tea", the picture doesn't look like it. 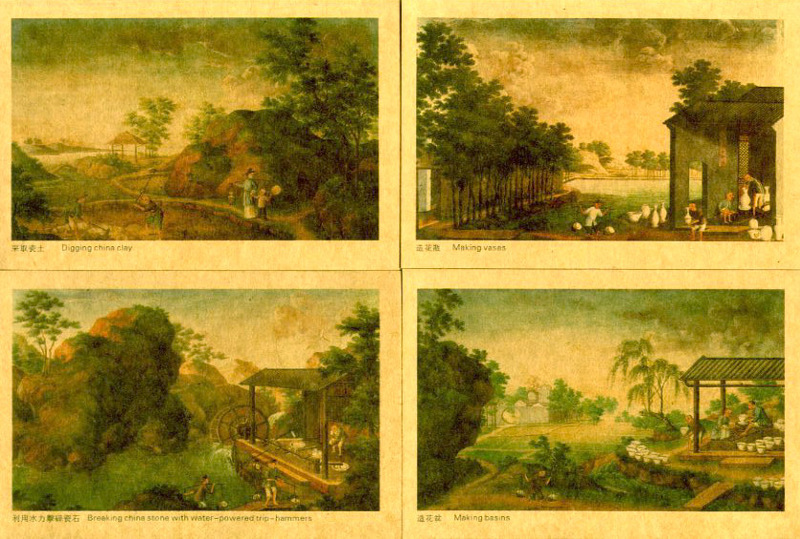 The pictures of trading site (Hong) and transportation are not necessarily specifically about tea trade. But they were the common scene of that time for trading of various goods, including tea. 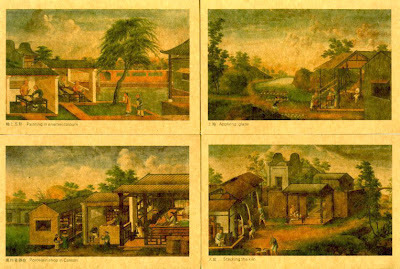 The last four pictures are about tea processing. Smaller size: 15.5" from shoulder to shoulder, and this width can be stretched to above 21". Length is 23". This is similar to female T-shirt size M in the US or slightly smaller. Larger size: 19.5" from shoulder to shoulder, and this width can be stretched to above 28". Length is 27.5". This size is similar to male T-shirt size M in the US or the female T-shirt size L to XL in the US. Since these are hand painted, they require more carefulness in washing. Hand washing is preferred, or at least for the first time. Ideally the shirt shouldn't be soaked in water for more than 30 minutes. When washing it for the first time, it helps to use salt water for the first rinse. If using machine washing, gentle cycle is required and the shirt should be turned inside out. There are two colors, yellow and white, with the same painted patterns. The front side has a painting of teapot and teacups, with a line (in Chinese) read as "There is a world in the teapot."